Born in Kure-city, Hiroshima in 1945. Studied marine biology at Hiroshima university. Formed a group Saibo-bunretsu (Cell fission) in Tokyo in 1969, and was also performing with various free-jazz musicians. Joined Yamashita Yosuke Trio from 1972 till 1979. In 1980 he formed his trio and its three month tour in Japan elicited a great public response. Its performance during this period was released as a live album POCHI. Besides the activity with his trio, he formed Wha-ha-ha,which gained much attention as a collective group of musicians with strong personality from different fields, and its debut album Shinutokiwa betsu created quite a sensation in the music world in Japan. In May he did two month tour in Europe with his regular trio. And in November he appeared in Berlin Jazz Festival 1981 with newly formed Sakata Orchestra which he formed with handpicked musicians. They were very successful in the Festival, which Lounge Lizards, James Blood Ulmer, Defunkt, Material, etc., also appeared. Its performance was recorded in the album Berlin-28. In the beginning of 1982, he formed Sakata-Sextet with an original group structure which included two drummers and two base-guitarists. Its stimulus sound filled with modern feeling can be heard in the album Trauma. In 1985 he formed his quartet and at the same time reformed his orchestra as Sakata Akira & his Da-Da-Da Orchestra. In 1986 he performed with Last Exit which was formed by Bill Laswell. This performance was recorded in Noise of Trouble/Last Exit Live in Tokyo. In 1988, he recorded Mooko with Bill Laswell and Ronald "Shannon" Jackson. This recording was released worldwide by Virgin Records. In 1994, for one month in the summer he led and carried out a tour to Uzbekistan, Mongolia and China with Flying Mijinko Band formed by14 members from Japan, Africa and America. The performance on this tour was recorded and the CD Flying Mijinko Band/Central Asian Tour was produced by the Japan Foundation. In 1999 he produced a new style folk music concert The World Music Festival - August in Hiroshima centered with Flying Mijinko Band with Bill Laswell and others. Now he works with his regular unit Harpacticoida, Sakata Akira "3" mii and also with Kesutoradamashi, by which he has been trying to combine different musicians freely. He has been working with a folk singer Hitoshi Komuro, a Wadaiko (Japanese drums) player Eitetsu Hayashi, a traditional Japanese folk singer Takio Itoh and so on, keeping an open mind to any music category. His latest work is Umi (La Mer)-Harpacticoida. Also he has been well known as an essayist with a unique point of view and writing style. He even appeared in films and on stage as an actoras well. Recently, he is well acknowledged as an ardent student of "Mijinko" (a water flea) and his experience through breeding and observing Mijinko has been arousing many people's sympathy by his deep insight and witty talk into the nature. In 1990, having grown in intensity of his interest to Mijinko, he organized Mijinko Club and he himself became its president. In 1992 he recorded the music for TV program, NHK Special "Nano Space" and this music was released as Nano Space Odyssey. In 1994 he produced The Mijinko Exhibition at Kasai Seaside Aquarium in Tokyo. In March 1996 he published a video The Universe of Mijinko(Sony Music Entertainment). 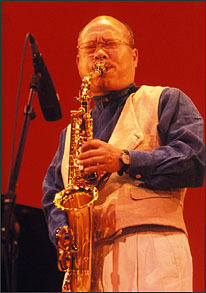 In May 2003, Sakata led his trio band "Sakata Akira mii" and performed in European cities of Dusseldorf and Paris. He was also engaged in documentary film making of [Shirakami no Yume] both as an actor and as the music composer. His years of study and ardent promotion activities on the Mijinko (water flea) won high recognition and was specially commended by The Plankton Society of Japan. In February 2004, he recorded the CD "Akatombo (red dragonfly)" which is the first release from his trio "Sakata Akira mii". During the summer this year, he enjoyed acting again in the movie [Umore-gi] directed by director Kouhei Oguri. (released in June 2005). In September 2004, the first CD of "Sakata Akira mii" was released from his own label Daphnia. In the same month, he joined DJ KRUSH to tour the US (NY and San Francisco), followed by Tohoku(northern Japan) in October and western Japan in November and December. In April 2005, the performance titled "Sakata/O'Rourke Tokyo Session" at the live house Pitinn was publicly recorded, which will be released by Polyster in December. The annual domestic tour to Tohoku by "Sakata Akira mii" began in June, to be followed by the tours in Aomori and Hokkaido in September and October. Some other planned releases are first, the DVD titled [Mijinko no Shizukana Uchu (Tranquil World of Mijinko (water flea))](with a special footage from his performance as an added bonus) to come in October, then the solo-recorded double album of [Hyakuhachi Bonnou (108 Desires)] to be on a sale from Ourai Records in December. As is clear from the above, he currently performs actively in various sessions focusing on his trio, "Sakata Akira mii". Note: For the details of the CDs and Records listed above, see "Works".